“Ui que freski!” can be heard as people pop out of their warm houses into the cool work morning air. Midday temperatures climbing and sunny (though not unbearably hot) sunsets disappearing in the blink of an eye and evenings creeping in sooner. Sorry folks but autumn is setting up camp for the next few months. Fruit and veg has grown full to bursting soaking up every last bit of summer sunshine getting itself ready for the harvest. Thankfully making its abundance present in our kitchens. A quintessential autumnal fruit is the pear. Once I see pears-a-plenty I know autumn is here. And I don’t mean long haul, greenhouse grown perfect pears; dry and hard to the bite. 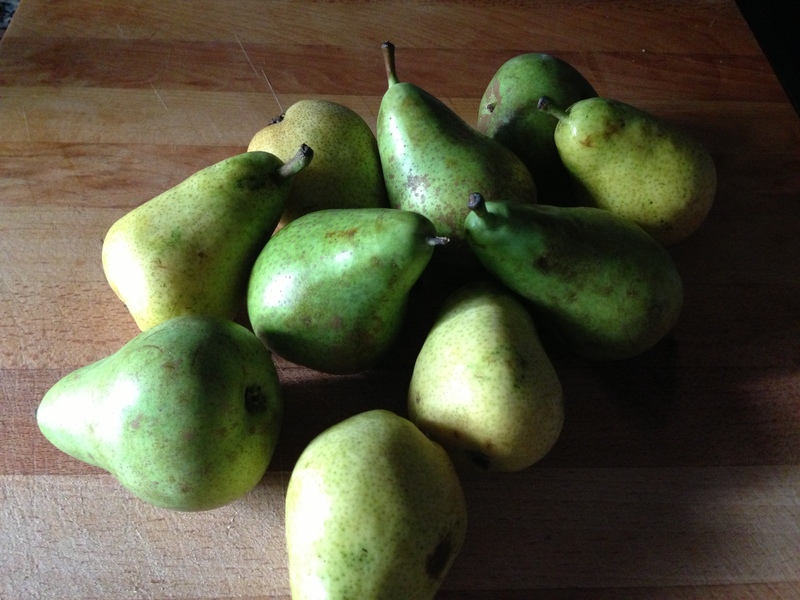 I mean pears of varying shapes and sizes, soft to the touch, buttery and bursting with juice. 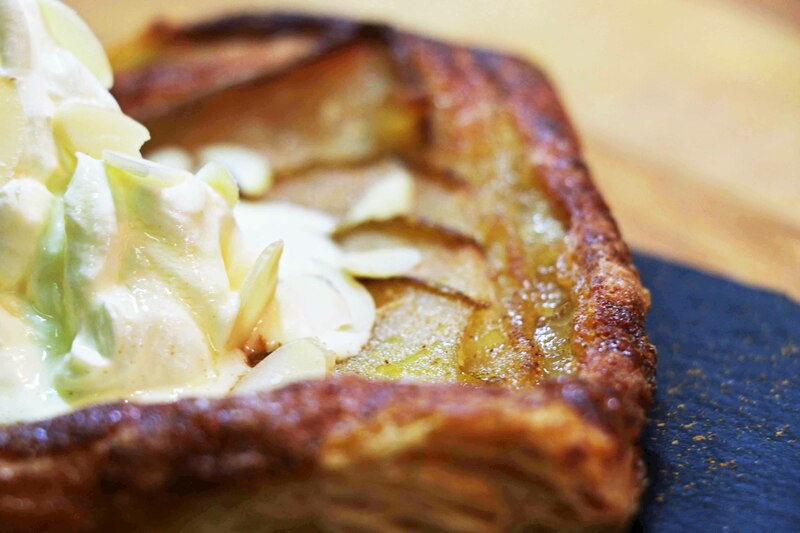 Outshined by apples every year, however, I find the pear just as versatile in the kitchen – it can be baked into cakes, used to top cheesecakes, used in salads, pureed, transformed into a chutney/relish, poached, used in main dishes as well as desserts. A great accompaniment to cheese, especially if it’s blue and let’s be honest, perry (pear cider) really is that much better than apple cider. So in a bid to extol the virtues of the underdog, I’ve created a few simple pear recipes to get your autumn pear imagination flowing. You can make both of these recipes simultaneously as they require similar ingredients and cooking times but their eatability is just as desireable! Serves 2 as a 2 course dinner but quantities can be easily doubled. 1st: Roll the block of puff pastry out onto a well floured board. 2nd: Cut the pastry into quarters and score the pastry with the tip of a knife creating a 1cm border around the outer edge (do not cut all the way through). If creating both the sweet and savory version, leave 2 quarters to one side. 3rd: Crumble the gorgonzola into a bowl and beat with a palette knife until soft. Spread a layer of this over inside of the border of each of your quarters. 4th: Slice half a pear per quarter and place ontop of the gorgonzola. Brush the border with either milk or an egg-wash.
5th: Place into a preheated oven at 200°C for 15-20mins or until golden brown. 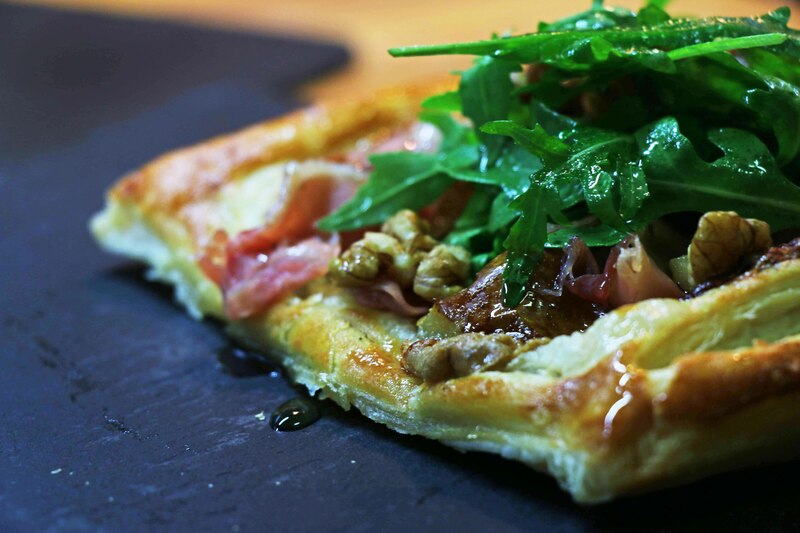 6th: Add slices of prosciutto, rocket leaves and walnut halves over before dressing and seasoning to taste. Complete stages 1 & 2 as above. 1st: Brush the inside of the quarters with egg-wash and sprinkle cinnamon, sugar and a piece of stem ginger per quarter (chopped finely). 2nd: Slice the pears finely and arrange half a pear per quarter. 3rd: Sprinkle with a bit more sugar and cinnamon. 4th: Egg wash the border and place into a preheated oven at 200°C for 15-20mins or until golden brown. 5th: Serve with flaked almonds and either cream (with some of the ginger syrup mixed in) or ice cream. Optional Extra – sprinkle the tart with ground ginger for added depth and warmth. Try any of the following or create some of your own; why not post your recipes here?